My husband and I enjoy gardening, as the outdoor gardening season in Toronto is short :) We encourage each other to keep our garden neat so we can admire it throughout the summer. We enjoy spending time watching birds, gardening different flowers, fruits and vegetables so it important for us to make sure our garden looks neat and maintained. To motivate us and not feel as though gardening is a chore, we think it is important to have the correct gardening tools. The rock and wooden gardening edges in our garden makes it hard for us to cut the grass that grows in the edges using the lawnmower. 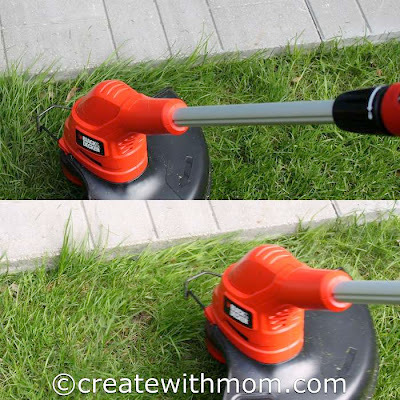 This 14" Black and Decker 6.0 AMP Dual line trimmer and edger has helped us overcome this problem. It has also made us perfectionists in the garden, as the trimmer helps us keep our garden neat and clean. The dual line automatic feed spool that is included in this tool allows us to continually cut without stopping, as the line advances automatically. We like using this corded string electrical trimmer because it is not powered by battery and there is no emissions or gas fumes. The ease of using one tool to do both the jobs is a big benefit for us; all we have to do is flip the tool to switch from trimming to edging. We appreciate the built in cord retainer, as it prevents the extension cord from coming unplugged. This lightweight GH710 model trimmer and edger has a 30 day free trial and 2 years warranty. It is sold at Lowes, Rona, Sears and Amazon. The patented power drive transmission in this trimmer and edger helps us get the job done faster because it has more cutting power. All we have to do is hold it in place where we want to cut. We like using this tool to cut and clean the grass that grows in the edges, as it gives the whole garden an attractive look.